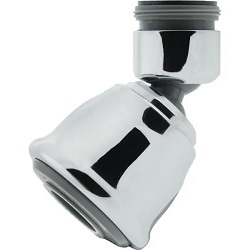 The Bubble-Stream 1.5 GPM Swivel Spray is WaterSense Certified and ideal for use on kitchen faucets. The pull down body easily transitions from stream to spray and swivels to get into those hard to reach areas of your sink. Its dual thread design connects to most standard size faucets with inside or outside threads.